Then Andrew, Simon Peter's brother, spoke up. "There's a young boy here with five barley loaves and two fish. But what good is that with this huge crowd?" Our resources are limited. God's aren't. Our wisdom is limited. God's isn't. Our power is limited. God's isn't. 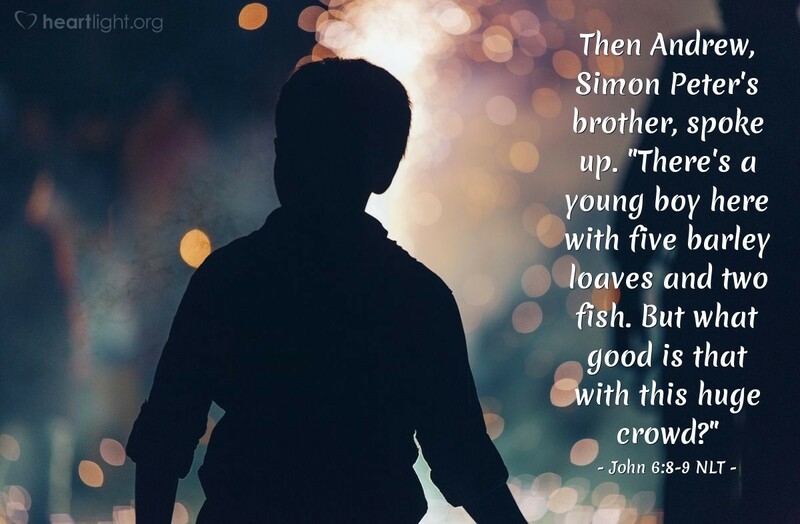 What we offer, in the face of a great need, is small ... until it is brought to God through Jesus, and then it is multiplied, empowered, enhanced, broadened, increased, and made to be sufficient. As observed yesterday, this expansion of our resources and abilities is not just our hope; it is God's track record throughout time with his people. Let's bring him what we have now to do his work, and not wait until we think we have the plan, the power, and the resources to do what only he can do. Let's quit waiting and wandering and wondering and bring him what we have. Lord God Almighty, God of Israel and God of the nations, I come offering you who I am and what I have to be used for your work in the world. I know that my resources and abilities may not go very far in the view of a world in so much need, but I bring them to you because you are the mighty God and they are what I have. I believe that you can do more with them than I can. In Jesus' name. Amen.